The olive tree can attain a height of about 20 feet (7 m) and typically grows to a ripe old age. 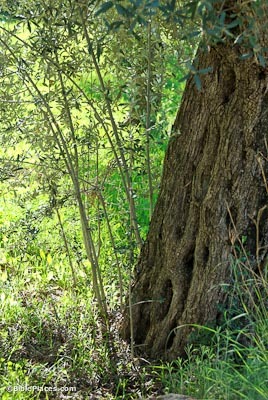 Some olive trees in Israel are estimated to be around a thousand years old. The rocky soil in Israel is conducive to the drainage necessary for the olive tree to prosper, and they thrive in the Mediterranean climate. Though the olive tree’s gnarled trunk becomes hollow with age, the tree still continues to bear fruit. 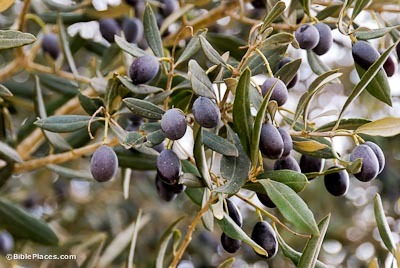 Zayit, olive, is referenced in the Old Testament nearly twenty-five times while shemen, the Hebrew word for oil, is used over one hundred fifty times. Oil in Scriptures always refers to olive oil. The frequent mention of oil indicates the great value of the tree in biblical times. This is also evident in the list of the seven species of the land in Deuteronomy 8:8, which speaks not of olives but of olive oil. 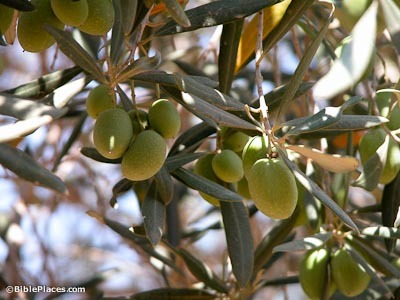 Olive oil was crucial to the economy and daily living of the Hebrews. It was used for lighting, cooking, medicinal purposes, and moisturizing skin. 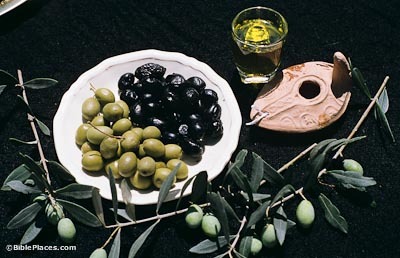 Although black when ripe, olives were harvested for oil production while still green. Harvesters would use sticks and beat the branches causing the fruit to fall (Isa 17:6; 24:13). The olives were then collected and pressed. 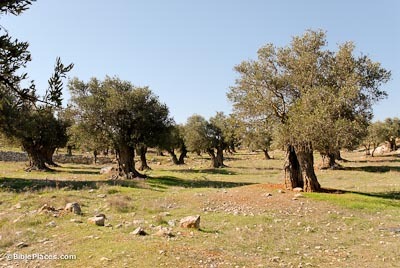 Olive trees were even more abundant in biblical times than they are in Israel today. Olive trees can grow on the plain and in the hills. They grow in Galilee, Samaria, and Judah. 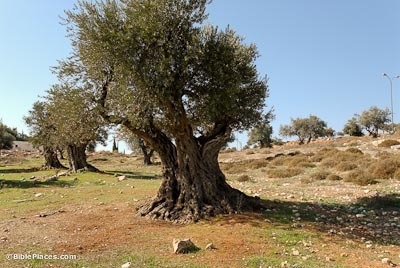 The Garden of Gethsemane, located at the base of the Mount of Olives in Jerusalem, was likely an orchard of olive trees since gethsemane means oil press. It is not surprising that this bitter fruit was not eaten in ancient days, since pickling and salting olives was unknown. The oil was used to anoint kings, prophets, priests, and Temple articles. Messiah, in fact, means “anointed one.” The wood of the tree was and is used for carvings. 1 Kings 6:23-35 speaks of the hard, beautifully-grained wood being used in Solomon’s temple. While wild olives are propagated from seeds, cultivated olives are planted using shoots that grow at the base of another olive tree. Psalm 128:3 uses this imagery in comparing children to olive shoots around the table. An olive shoot is also seen in the messianic prophecy of Isaiah 11:1. Psalm 128:3 (NIV) — Your wife will be like a fruitful vine within your house; your sons will be like olive shoots around your table. Isaiah 11:1 (NIV) — A shoot will come up from the stump of Jesse; from his roots a Branch will bear fruit. 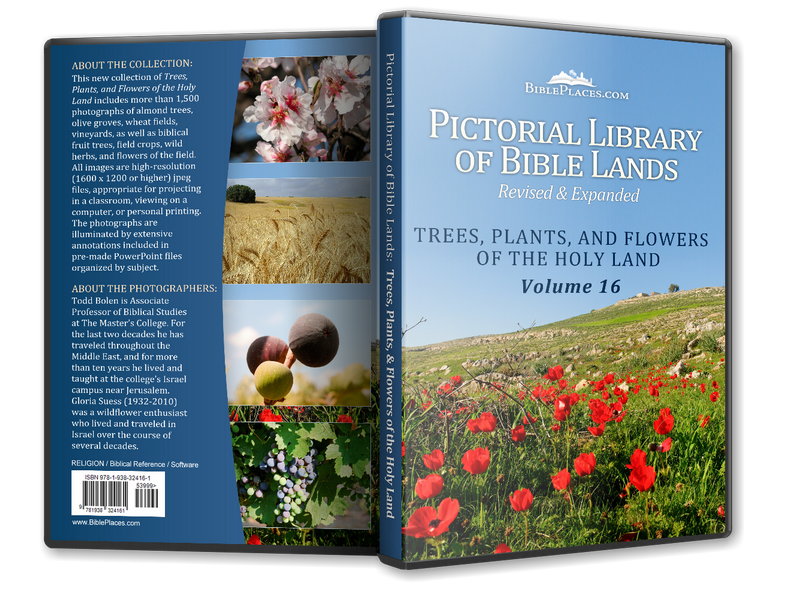 Download all of our Trees, Plants and Flowers photos!